A typical fisherman knows the drill: prepare the gear, head out before the sun is up, pick a spot and wait for the fish to bite. Fishing can involve a lot of sacrifice. But it can also offers some great perks and there are many health benefits of fishing for those who practice it regularly. Just like any other sport, fishing improves the body’s defense system, the function of the heart, burns calories, and strengthens many muscle groups. It also helps you absorb nutrients that are essential for you to put on your best performance. But the rewards are not limited to the body: a day out next to the water can improve your mental state and mood for the whole week! As a relaxing activity that connects mind and body, fishing can aid in preventing and reducing stress, anxiety, and depression. It’s also a great opportunity to deepen your relationship with your loved ones and with yourself. 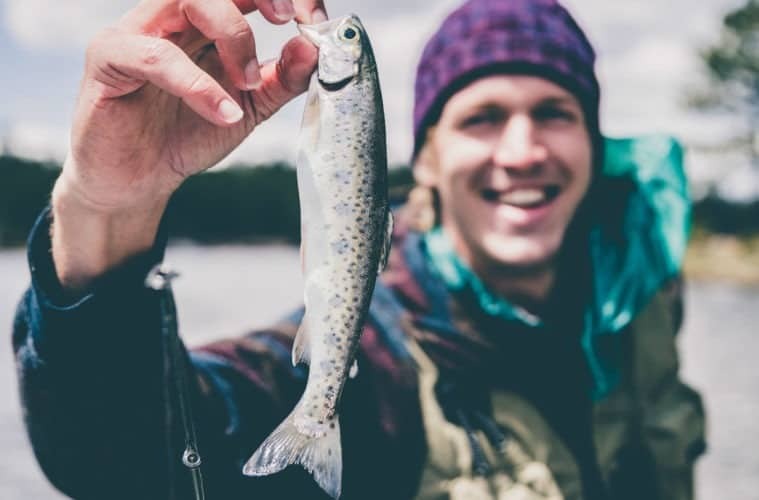 Whether you practice fishing regularly or are drawn to try it for the first time, read on to find out more about all the ways in which this sport keeps your health in tip top condition. Fishing is a great sport to practice with friends or family. Leisurely standing or walking by the water lends itself to conversation— or just companionable silence. When you teach a son, daughter, or another loved one to fish, you are building a bond as well as passing on valuable life skills such as self-reliance and patience. What’s more, healthy relationships mean a healthy body and mind! A strong social network means better healing and well-being, and a longer life. Even if there were no obvious health benefits involved, what’s better than fostering bonds with the important people in your life? All those idyllic pictures of fishermen by the water look incredibly relaxing, but the real thing is even better! Fishing forces you to slow down, take it easy, and perceive your surroundings. Relaxing might look like doing nothing, but it really boosts all aspects of your health: by lowering stress levels you keep your blood pressure normal, prevent anxiety and other illnesses (both mental and physical). A low-stress lifestyle means better heart function and a better, longer life. What’s a better excuse to kick your feet up, stare at the horizon, and wait for a fish to bite? Never mind yoga! Fishing is a great way to strengthen the connection between your body and your mind, making you feel more balanced and present. Moving with intention— being conscious of what you are doing and thinking— does wonders for lowering your stress levels. This also helps you improve posture, balance, and mood. You carry the benefits of mind-body connection into all areas of your life! Do you ever feel like you are always on the go? Our modern lifestyle has us running for appointments, deadlines, and never-ending projects. This can cause severe anxiety and doesn’t let you live your best life. Fishing, being a slower paced activity, can help prevent this. Fishing also exposes you to much-needed sunlight that gives you a good dose of Vitamin D. This nutrient is essential in order to avoid depression, but research shows that a great percentage of the global population doesn’t get enough to be healthy! If you want your mind and mood in tip-top shape, go fishing, relax, and stay in the sun. But to quote Baz Luhman – wear sunscreen! Another perk of the Vitamin D is an immune system that works just as it should. By being outdoors in the sun, you are helping grease the wheels of your body’s natural mechanisms for fighting off infection and illness. Vitamin D means that you absorb other crucial nutrients better, which keeping your white blood cells— the defensive forces— active. This way, you will be able to fend off many illnesses: from the common cold to more serious ones like frail bones and asthma. To stay healthy and strong, spend a day fishing in the sunlight! Speaking of strong and able bodies: cardio (exercise that makes your heart rate go up) is a must to keep your heart and the rest of your body working well. Now, not all fishing is the same. If you are sitting down, your heart rate will stay pretty low, but, if you are constantly moving, you will get the benefits of cardio exercise. Even more so if you catch a fish! You can alternate between a relaxed way of fishing and a more active one. This way, you will not get so tired as to quit. Everything in moderation! Think of all the movements you make when fishing: walking, squatting down, casting the line, reeling in the catch… The list goes on! All this movement burns lots of calories (up to 340 an hour, depending on the method used) and works all the muscle groups in your body. This is anaerobic exercise— the kind of training you do at the gym to build muscles, only performed in a natural and functional way (if you are lucky with your catch, expect some ripped arms!). Not only does fishing bolster the power of your mind and patience but of your entire body. Phew! Those who think fishing is a walk in the park have clearly never tried it! All jokes aside, the good thing about fishing is that you can make it as relaxed or as dynamic as you want. If you feel like enjoying its grounding perks, sit by a lake with a cold beer and look like a perfect postcard. If you are feeling energetic, you can scout out new areas and give a couple fish a good fight. Now that you know all the body-and-mind health benefits fishing offers, what are you waiting for? Pick up your rod, steamroll a buddy into coming with you, and head to the nearest bank or shoreline!